* TERRENCE McCLENDON , – One of the original NLP developers from Santa Cruz California went on to become the founder of NLP in Australia. 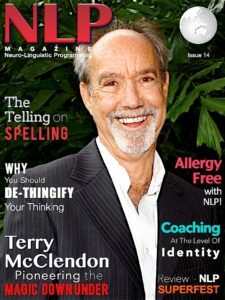 In this article Terry shares his story of Australia’s first NLP training at Mt Buller in Victoria, and his journey of pioneering NLP down-under. * KRIS HALLBOM Allergies: Many suffer from them, and medicine would have us believe that the only way to treat them is well, medically!. But those happy to venture outside the box will be delighted to learn that many allergies are just a product of old learning. And as they say – if you can learn something, then you can unlearn something. And it can happen fast! 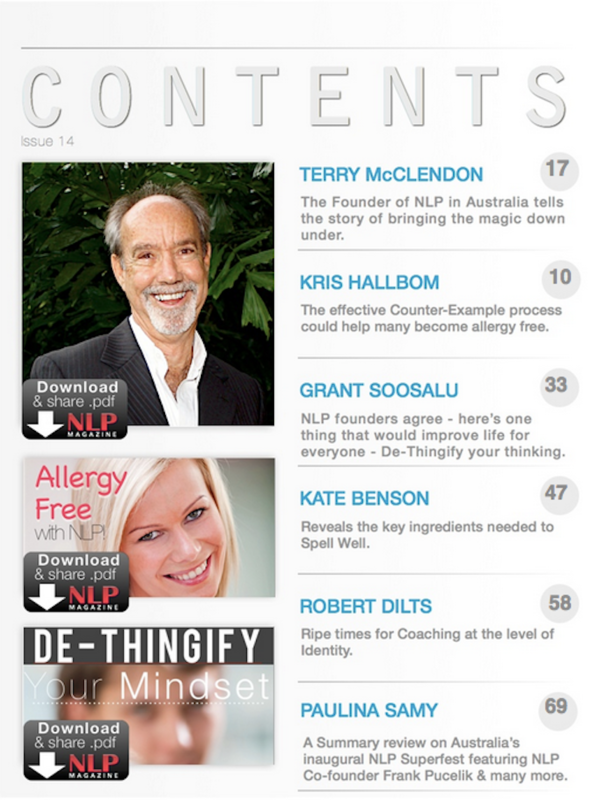 Kris Hallbom reveals how you could be Allergy Free using this very-much under-utilised NLP based process. * GRANT SOOSALU Looks at how your words are dumbing you down and the neuroscience behind it. Seriously, he makes some excellent points and I can assure you it is a read you will take with you and keep you thinking on it through the day. Especially is you are doing any talking! * KATE BENSON leads a new paradigm in education, and shows how to get better at spelling FAST! * ROBERT DILTS tells us about the huge value in Coaching people at the Identity level compared to coaching focused on abilities. His Neurological Levels model will help you ground this information in a way that gives you a powerful revolutionary new approach to helping clients not only get the changes they desire, but also doing it in a generative way. If you want to take you coaching abilities to the next level – read this and get a taste of how well it works. * PAULINA SAMY Reviews the Australian history-making 2014 NLP Superfest that welcomed NLP’s quiet-achiever and 3rd Founder, Frank Pucelik to Australia for his first visit. 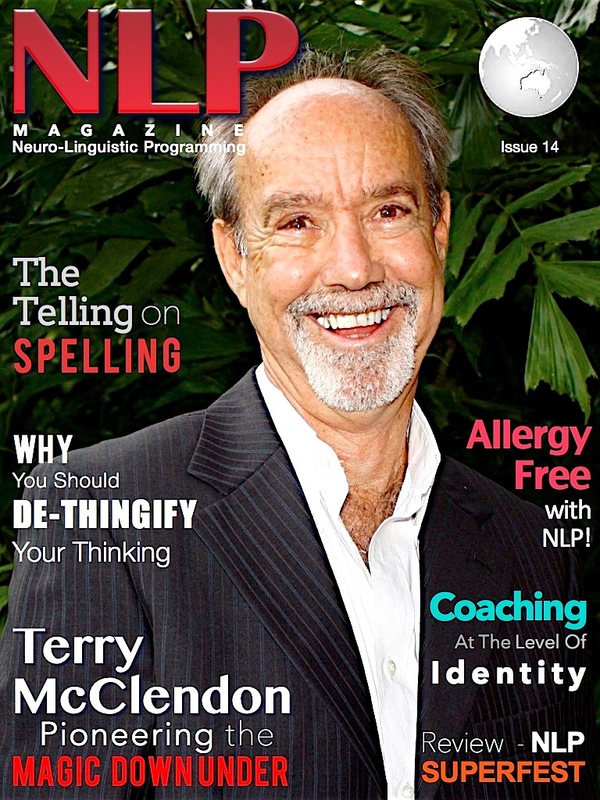 NLP Magazine is Your Convenient Connection with the World of quality Neuro-linguistic Programming. This entry was posted in Magazine Editions and tagged Allergic reactions, Allergies, GRANT SOOSALU, Healing allergies, Kris Hallbom, Marvin Oka, Mbraining, Meta-NLP, Mind on matter, NLP Australia, NLP for kids, NLP Magazine, NLP science, NLP Training, NLPCA, NLPU, Paulina Sammy, Pete Tarca, Robert Dilts, TERRENCE McCLENDON. Bookmark the permalink.